The cysteine protease inhibitors, clitocypin and macrocypins, from higher fungi (mycocypins), together with the serine protease inhibitors highly specific for trypsin cospin and cnispin from higher fungi (mycospins), display several characteristics that distinguish them from protease inhibitors from other sources. 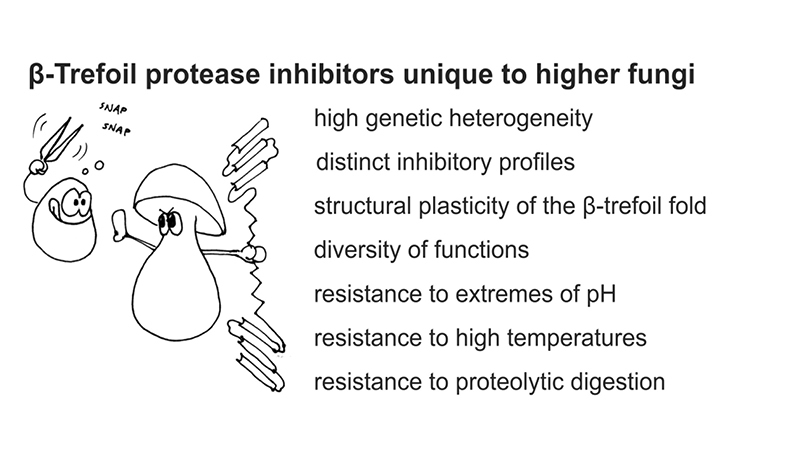 Their high genetic heterogeneity affects their functionality and/or stability and results in numerous protein variants with slightly different inhibitory profiles that influence the type of protease inhibited and/or the strength of inhibition. They possess the β-trefoil fold that shows high plasticity in their utilization of the 11 diverse loops for the inhibition of various families of proteases through different mechanisms of inhibition. Their high versatility is also seen in their regulatory and defence functions and in their potential applications in biotechnology, crop protection and medicine.